Joining the Range Rover Velar at the Geneva Motor Show is a unique Land Rover Discovery 5, which is the work of Jaguar Land Rover’s (JLR) Special Vehicle Operations (SVO). Dubbed Project Hero, the advanced communication vehicle was built for use by the Austrian Red Cross, in the hopes it will save lives by speeding up response times to disasters. Aside from a repurposed interior that is packed with an array of tools, multiple frequency radios, and other rescue-related equipment, Project Hero also comes equipped with a roof-mounted drone that allows live footage to be transmitted to the emergency response team. This is particular important because following a disaster such as landslides, earthquakes, floods, and avalanches, dramatic landscape changes can render existing maps redundant. With a bird’s-eye view from the done, rescuers will be able investigate an emergency scene from a safe distance, and respond quicker. Project Hero also features a fully integrated landing system with self-centring and magnetic retention technology (a world first), enabling the drone to land even when the vehicle is in motion. The vehicle is painted with the colours of the Red Cross, where the lower portion is white, while the roof, bonnet, and side mirrors are red. A 3.0 litre TD6 engine powers Project Hero, which will be based at the Austrian Red Cross training centre in Erzberg, in the mountainous Eisenerz mining area, and in Vienna, for 12 months from June 2017. Land Rover has supported the Red Cross since 1954, and has supplied 120 vehicles to the IFRC for deployment in all corners of the globe. 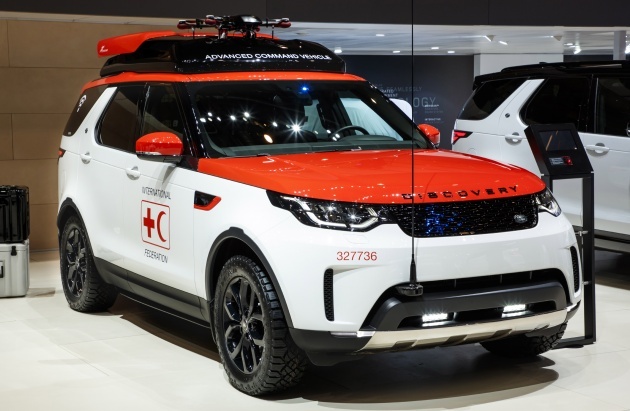 “Land Rover and the team of engineers and designers at SVO are proud to support the incredible humanitarian work of the IFRC and its members. “The new Discovery is an outstanding all-terrain SUV, and Project Hero is the optimum combination of enhanced capability and innovative technology. We hope to help the Red Cross save lives in emergency situations,” said John Edwards, managing director of JLR SVO. Next Post: VIDEO: The Fate of the Furious – new trailer is here!